This morning the Department of Justice filed a statement of interest in support of Dalton & Tomich client Hope Lutheran Church in its religious land use case against St. Ignace, Michigan. 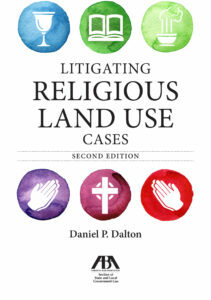 The Department of Justice files statements of interest when it determines that a case addresses important issues concerning the interpretation and enforcement of the Religious Land Use & Institutionalized Persons Act (“RLUIPA”). The case which was filed last September challenges the City’s failure to treat religious assemblies on equal terms with nonreligious assemblies. The suit was filed after Hope Lutheran’s small congregation was told by City officials that its property was not zoned for a church. The City’s Zoning Code, however, freely permits non-religious assembly uses, such as assembly halls, townhalls, and theaters at the property, but unlawfully prohibits religious assemblies. As we have argued in our briefs, the Zoning Code allows an assembly hall at the property but not an Assembly Hall of Jehovah’s Witnesses, for example. RLUIPA requires municipalities to treat religious assemblies and nonreligious assemblies equally. The religious content of an assembly use should not determine whether the use is permitted or prohibited. Within just six weeks of filing suit and less than a month after the Church filed a motion seeking a preliminary injunction, the City agreed to stipulate to an order that allows the Church to use its property for religious assembly and church services during the pendency of litigation in order to address the irreparable harm to the the Church’s religious exercise. But instead of settling the case with the Church, the City filed a motion to dismiss the case arguing that it could treat religious assemblies differently because churches do not maximize tax revenue and may affect the issuance of liquor licenses in the vicinity. As we argued in our brief and as the Department of Justice argues in its statement of interest, the City cannot justify its unequal treatment of religious assemblies on either basis. The case is set for a hearing on April 1st, and Dalton & Tomich attorneys Noel Sterett and Larry Opalewski will argue the case. If your religious institution or assembly is experiencing municipal opposition and difficulty obtaining zoning approval, please contact us.